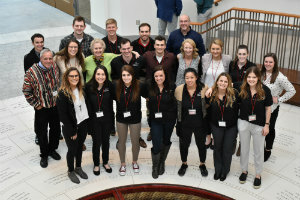 Miami University hosted the 29th annual Midwest Sport and Exercise Psychology Symposium (MSEPS) in collaboration with the Association for Applied Sport Psychology, an international sport psychology association.The MSEPS is a conference organized primarily by graduate students for students to present their research. The conference location rotates each year among universities in the Mid-West region. This year the conference was attended by over 130 students, faculty, and practicing professionals from the University of Tennessee, University of Windsor, Purdue University, University of Minnesota, Illinois State University, Michigan State University, Ball State University, Wayne State University, West Virginia University, Indiana University, and George Mason University. Miami was represented by faculty in the Sport Leadership (Sport Psychology) program, over 30 current graduate and undergraduate students, and alumni who are currently doctoral students or university professors in sport psychology.